Recycling electronic disposables in Pico Rivera is now made easy, simple through All Green Recycling’s IT Asset Disposition, IT Asset Remarketing, and Hard Drive Shredding. Recycling old, disposable electronic products is easy with All Green. Trust us as we have proven solutions. Disposing of remarketable IT asset is our expertise. We can help you earn 70% from the net resale profit. Destroying sensitive files and information is our way to protect your business brand. Trust us today. Destroying defective and end-of-life electronic products is a sure way to protect your business growth. The lifespan of every computer unit is from 18 to 24 months. Meaning, every year or every two years, every computer user must replace his or her unit. For business people, this is quite important as far as boosting the earnings is concerned. But the repercussion is the accumulation of electronic waste. If this problem is not addressed, you can contribute to the increasing number or volume of electronic products deposited in the landfills. To avoid landfill e-junk issues in this area, All Green offers Electronics Recycling Pico Rivera Services. Pico Rivera is located at the southern edge of the San Gabriel Valley region in Los Angeles County, California. It is particularly the home to over 65,000 residents and nine parks and playgrounds. 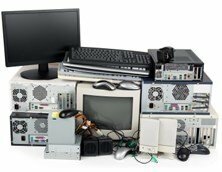 You can schedule now an e-waste pickup through the link below. Electronic items are disposables. Every now and then, you will replace your item due to the arrival of new models and versions, which are much faster than your previous one. Because it results to more EOL IT equipment on the garbage bins, this world has been suffering a lot. The impacts of cadmium, copper, mercury, and other metals are irreversible. But good news… We can still do something to stop such impacts. A responsible electronic waste recycling is being promoted worldwide. Hence, you need to try All Green’s e-waste management and disposition services. With us, you can be guaranteed that no landfills will suffer from electronic junk anymore. The locations on the map are now ready to be served by All Green. We have the expertise and experience to render the services you badly need. We’re expert because we have the right people and we use most modern recycling technologies.